When it comes to luxury sedans, a lot of people shop by the badge first. For discerning buyers that can look past the German brands, Infiniti's Q50 mid-sized sedan is in the mix. And for those that favor a little more snarl under the hood, the may be a funny name but it’s no joke as it showcases what Infiniti can do when the brand wants to get technical. If you remember the top sport spec Q50 from before this refresh, then the 400 horsepower twin-turbo V6 engine is the headline you probably remember. The double wishbone suspension on all four corners keep things well planted and the upgrade in brakes is a solid antidote for the extra power. Go back into comfort mode and pick up a passenger and the Red Sport falls back into the state of a big relaxed muscle. The suspension is well tuned for comfort and road noise is minimal. It’s pleasant and h around town then shines on the highway, particularly with the predictable power always on tap. 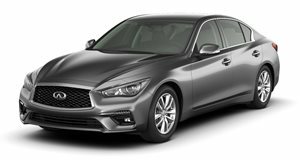 The base starting price for the Q50 is $35,550 and comes with the 2.0-liter turbo 4-cylinder engine, then you can add Infiniti’s all-wheel-drive system for another $2,000. If you want the 300-hp twin-turbo 3.0-liter V6 engine, that starts at $40,300. Take that in the Sport trim, and you’re looking at $47,950, another $2,000 for the AWD system. The Q50 line has been streamlined, so the 3.5-liter V6 hybrid powertrain option is gone. Carbuzz spec would look a little different. The extra lighting is very nice and the trunk carpet is h for someone wanting to splash out, but we would definitely drop the carbon-fiber option as it doesn’t necessarily suit the car and we like it as a sleeper.